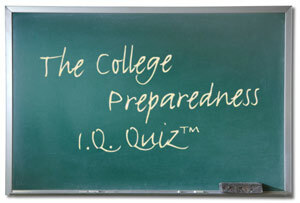 The College Preparedness I.Q. Quiz™ is a fun way to see if you already have the goods to impress your professors. Most professors assume their students are fresh out of high school, though most likely you’re not; you’re a nontraditional student. Don’t go stir crazy if you don’t know the answers. Besides, a college or university is a place for higher learning, even adult learning. Thus, these are some learning exercises you might encounter in college. No cheating!